General Hospital (GH) spoilers tease that Jason (Billy Miller) and Patient Six (Steve Burton) will anxiously await proof that backs up their claims. The twin story will flip-flop a bit in the coming months, but it appears Sam (Kelly Monaco) already knows the truth in her heart. GH just gave us some major clues about the way this hot plot his headed. Jason is obviously feeling rattled and insecure right now. He pushed Sam to confirm that he was the real Jason, but she couldn’t bring herself to make the declaration. It’s clear that Sam doesn’t quite believe that yet and she probably never will. Sam was careful with her words to current Jason. She indicated that he was her husband, Scout’s father and the man she loves. Those powerful statements mean far more than a name ever could. Sam later added that she had Jason’s back no matter what. She even warned Franco that Patient Six would dismantle him, so that’s another huge hint. Sam must know that only classic Jason would do that. It looks like GH just set up the ending of this storyline. 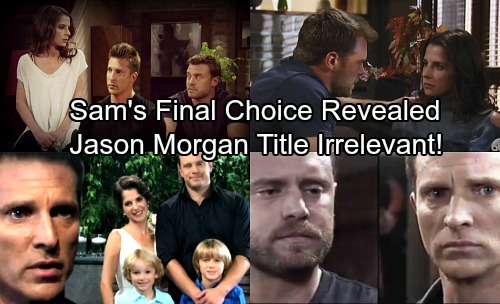 Once all the twists and turns have played out, there’s a good chance Burton’s character will be the true Jason Morgan. He’ll most likely win the title, but it’s doubtful he’ll get the girl. Sam seems completely content with current Jason. She’s changed a lot since Burton’s Jason was in the picture. Now she’s in love with Miller’s character and the warm safety he brings to her life. They’ve built a new family together and she likes the path they’re headed down. Classic Jason will never turn his back on Sonny (Maurice Benard) and that’s just not acceptable to Sam anymore. She wants a handsome media mogul who comes home to her at night. Sam is done with waiting and wondering if she’ll have to plan a funeral the next day. With classic Jason, Sam would always be in that position. She’d never escape the danger she’s been desperately running from. Sam certainly doesn’t want to come second to Sonny Corinthos! General Hospital spoilers suggest that Jason may be stripped of his identity, but his favorite gal will probably stand by him. Even if she finds out Jason is Drew, it shouldn’t matter. That’s certainly the point Sam’s been making lately. Are you hopeful that Sam and Miller’s character can make it work? If current Jason is indeed Drew, will Sam stick with him anyway? We’ll give you updates as other General Hospital news comes in. Stay tuned to ABC’s GH and don’t forget to check CDL often for the latest General Hospital spoilers, updates and news.